The Lenovo Storage DX8200C powered by Cloudian appliance provides affordable, highly efficient, high-capacity storage to meet the growth of unstructured data, including media images, video, backups, web content, and file shares. It makes it easy to build full-featured, on-premise Amazon S3-compliant storage at a cost of pennies per GB per month. The pre-validated Lenovo system that is based on the Cloudian HyperStore object-storage platform provides petabyte-level scalability, high resiliency, geographic independence, and multi-tenancy. This product guide provides essential pre-sales information to understand the structure of the Lenovo Storage DX8200C, its key features and specifications, components and options, and configuration guidelines. This guide is intended for technical specialists, sales specialists, sales engineers, IT architects, and other IT professionals who want to learn more about the Lenovo Storage DX8200C and consider its use in IT solutions. Product availability: The Lenovo Storage DX8200C is withdrawn and no longer available for ordering. The Cloudian HyperStore software provides enterprise-grade, scalable, secure and cost-effective object storage solutions for on premise, private and hybrid clouds. It delivers multi-data center storage with no constraints on data size; unlimited scale; optional, fully automated data tiering to any S3 cloud; and support for all S3 ecosystem applications (1000+ and growing). HyperStore ensures seamless S3 integration with every available AWS/S3 application. The Lenovo Storage DX8200C is shown in the following figure. The Lenovo Storage DX8200C is built on industry-leading Lenovo servers that feature enterprise-class reliability, management, and security. HyperStore’s peer-to-peer architecture allows almost endless scaling from as few as three servers to many hundreds of servers, across data centers and geographic regions. The Lenovo Storage DX8200C is designed for always-on data storage with protection using Erasure Coding and Replication. It is secured with encryption, certificate-based access controls, and multi-tenancy controls. The Lenovo Storage DX8200C powered by Cloudian solution is part of the Lenovo StorSelect Software Defined Storage (SDS) program, which provides quality, engineering expertise, and Lenovo’s worldwide global services. You can quickly and confidently deploy new SDS technologies using preloaded appliances with software from best-of-breed Independent Software Vendors (ISVs) on proven Lenovo systems. The Lenovo Storage DX8200C powered by Cloudian HyperStore provides an affordable, highly efficient and durable storage platform to meet the growth of unstructured data. It has virtually unlimited scalability with native support of hundreds of S3 applications. The Lenovo Storage DX8200C infrastructure is shown in the following figure. Builds highly cost effective data storage by securely moving data between public and private clouds. Uses industry-leading Lenovo servers to deliver highly scalable and durable software defined storage with modular architecture that accommodates hot-swappable, redundant, and highly available components to eliminate downtime, data migration, and forklift upgrades. Scales on demand with your business. Lenovo Storage DX8200C systems can grow from tens of terabytes to petabyte scale and beyond. Designed to tolerate all disk, server, rack, network and datacenter failures and automatically fixes inconsistent data. Choose from various data protection options via storage policies based on cost efficiency and security levels. The intelligent storage system can capture additional information about your data and run in-place analytics on that data. Designed from the ground up to support multi-tenant applications and to isolate and protect tenant data with built in quality of service (QoS), billing and reporting. Configure chargeback, rate plans and report storage utilization based on users, department and applications. 100% software-defined storage architecture which dynamically adjusts to changing demands and allows your storage to scale with your business needs. Fully S3 compliant API deliver broadest range of S3 feature coverage and 100% fidelity with AWS S3 API. Automatically distribute data in one or multiple data center across the globe with single global namespace. The following figure shows the front view of the Lenovo Storage DX8200C. The following figure shows the rear view of the Lenovo Storage DX8200C. The following table lists the system specifications of the Lenovo Storage DX8200C appliances. Form factor 2U Rack-mount (Machine Type 5120). Memory 12 DIMM sockets. Support for 16 GB and 32 GB RDIMMs. Memory speed up to 2133 MHz. Memory capacity Up to 384 GB with 12x 32 GB RDIMMs. Memory protection ECC and Chipkill. 2x 10 GbE SFP+ ports on the dual-port Intel X520 10 GbE adapter (Intel 82599 NIC). 4x 10/100/1000 Mbps Ethernet (BCM5719 NIC) RJ-45 ports on the system board. Boot drive 2x 2.5-in. SATA hot-swap SSDs (rear) in a RAID 1 array connected to the M1215 controller. Rear: 2x USB 3.0, 1x DB-15 VGA, and 1x 10/100/1000 Mbps Ethernet (RJ-45) systems management. Cooling Calibrated Vectored Cooling with four redundant hot-swap fans. Power supply Up to two redundant hot-swap 750 W AC (100 - 240 V) High Efficiency Platinum AC power supplies. Systems management UEFI, Integrated Management Module II (IMM2.1) (Renesas SH7758) with Advanced Upgrade, Predictive Failure Analysis, light path diagnostics, Lenovo XClarity, Cloudian Management Console. Security features Power-on password, administrator's password, Trusted Platform Module (TPM) 2.0-ready, Secure Sockets Layer (SSL), data-at-rest encryption. Host connectivity Simple Storage Service (S3). Hardware warranty Three-year customer-replaceable unit and onsite limited warranty with 9x5 next business day (NBD) parts delivery and remote technical support. Optional service upgrades are available: technician installed parts, 4-hour or 2-hour response time; 6-hour, 8-hour, or 24-hour committed repair; 1-year or 2-year warranty extension. Software maintenance Three-, four-, or five-year software license with support and subscription. 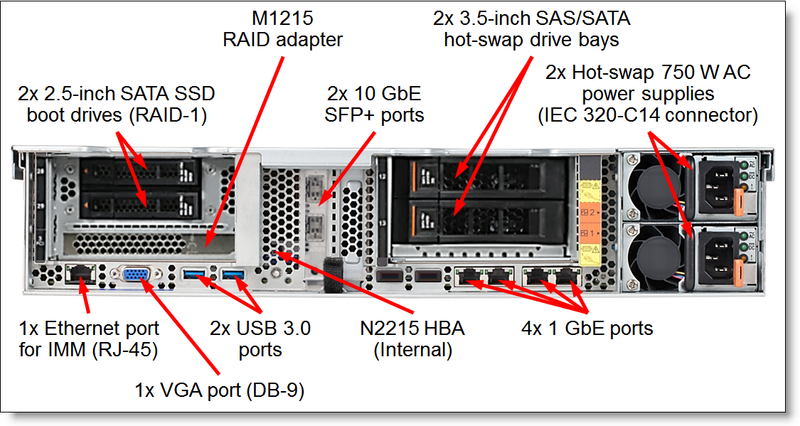 The following table lists the base models of the Lenovo Storage DX8200C nodes. Custom factory-build models can also be used. Note: A minimum of three nodes are required per solution; each model number represents one node. * x in the Model number represents a country- or geo-specific letter (see the note below the table). ** Software and support license is required and must be purchased together with the appliance based on the total capacity of a storage solution (See Software for details). The Lenovo Storage DX8200C ships with one Intel Xeon processor E5-2630 v4. The processor specifications are listed in the following table. The Lenovo Storage DX8200C supports Lenovo TruDDR4 memory. TruDDR memory is selected, tested and tuned to maximize performance and reliability, and it enables extended memory performance features to support memory speeds that exceed industry standards. The appliance supports up to 12 DIMMs with one processor. The processor has four memory channels, and there are three DIMMs per channel. Note: The appliance has 24 DIMM slots, however, it supports only up to 12 DIMMs. Lenovo engineering tested and validated system designs that support memory speeds beyond Intel memory specifications, which provides benefits for workloads that require memory speed and density. Lenovo TruDDR4 memory is fully supported up to the rated speeds that are shown in the following table. The following table lists factory-configurable memory options that are available for the Lenovo Storage DX8200C. Note: At least 64 GB of memory is required per appliance. The Lenovo Storage DX8200C supports the internal drive bay configurations that are listed in the following table. The SSD boot drives are configured in a RAID 1 array. The following table summarizes features of the storage controllers used in the Lenovo Storage DX8200C. * Connected via the SAS expander that is built into the 3.5-inch drive backplane. The following table lists the factory-configurable hard drive options that are available for selection. The following table lists the factory-configurable solid-state drive options that are available for selection. The Lenovo Storage DX8200C provides two-port 10 GbE and four-port 1 GbE network connectivity. The Intel X520 10 GbE Dual Port 10GbE SFP+ Adapter that is based on the Intel 82599 network interface controller (NIC) provides two 10 GbE ports with SFP+ connectors. The onboard 1 GbE solution that is based on the Broadcom BCM5719 chip provides four 10/100/1000 Mb Ethernet ports with RJ-45 connectors. The 10 GbE SFP+ ports require SFP+ transceivers or direct-attach copper (DAC) cables that should be ordered together with the appliance (up to two SFP+ transceivers or DAC cables per appliance). The following table lists supported SFP+ transceiver and cable options. Note: The Lenovo Storage DX8200C ships with one 1.5 m SFP+ Passive DAC Cable (00AY764). The Lenovo Storage DX8200C supports up to two redundant power supplies, and is capable of N+N redundancy. If a model comes with one power supply, the second power supply can be ordered as an option. The following table lists the power supply options. The Lenovo Storage DX8200C models listed in Models ship with two 1.5m, 10A/100-250V, C13 to IEC 320-C14 rack power cables. A hot-swap power supply option comes with one 2.8m, 10A/100-250V, IEC 320-C13 to C14 rack power cable. Other country-specific line cords or rack power cables can be ordered with the Lenovo Storage DX8200C, if needed (see the following table). Allows developers continued use of Amazon’s S3 SDK without any changes to S3 APIs in development. Scales to thousands of nodes and billions of objects in a bucket for reliable, affordable and scalable hybrid, private and public cloud storage solutions with granular storage policy management, reporting and administration. Multiple users and applications can use and share a single scale-out storage infrastructure with Role Based Access Control (RBAC) to control access to users’ data. Users can select and provision storage services on demand from a service catalog through a self-service portal. Uses QoS to vigorously control usage rate limits for each group or on a per user basis. Dynamically controls storage quotas for each group or on a per user basis. Creates logical storage policies for groups or users with either replication or erasure coding storage policies, or a combination of both to easily meet your IT requirements for data protection and data availability. Users can define their own policies for data protection to allow IT administrators to focus on providing Storage as a Service (STaaS) and giving users the self-service look and feel of an AWS S3 service while providing IT oversight and control. Defines tiering policy on a per bucket level and automatically tiers to Amazon S3, Glacier or other S3 endpoints such as tape libraries. Supports geo-distributed model that enables lower latency and provides better cloud services performance with a single global namespace. Built-in analytics easily performs chargeback at the group or user level and creates usage and storage reports for accounting purposes. SSL support for secure access and supports AES 256 encryption for data-at-rest on premise and on public clouds. Supports logical storage policies with the data consistency levels to meet your IT and data protection requirements. Granular metadata management at the object level with metadata and file that are bundled into an object for near-infinite scalability of highly available shared storage. Users can dynamically manage their own data and object retention period with IT having the management oversight for security and long term data protection. Tracks and logs signs of problems with a node, disk, or network failure, or incomplete I/O to quickly pinpoint the problem and rebuild the data in a matter of hours instead of days. Enables an administrator to easily locate any object and determine the number of copies that exist, as well as their exact storage location across geographically dispersed data centers to meet compliance regulations. Objects are checked on a read request and missing or out-of-date replicas are automatically replaced or updated. Users can access different revisions of the same file stored on the system with a S3 client. Uses secure SNMP traps and JMX for system monitoring and for charge back reporting. Deploy multi-site clusters for disaster recovery purposes and to ensure your data is highly available and always on. Provides the ability to replicate objects to other S3 endpoints such as another Cloudian HyperStore for disaster recovery (DR). The models of the Lenovo Storage DX8200C listed in Models come with a 3-year software support and subscription license for the total internal storage capacity of the particular model. For custom models of the Lenovo Storage DX8200C, software licenses must be purchased together with the appliances. The number of licenses required is based on the total storage capacity of the entire solution. The software license options are listed in the following table. The Lenovo Storage DX8200C contains Integrated Management Module II (IMM2.1), which provides advanced service-processor control, monitoring, and an alerting function. If an environmental condition exceeds a threshold or if a system component fails, the IMM2.1 lights LEDs to help you diagnose the problem, records the error in the event log, and alerts you to the problem. The Integrated Management Module Advanced Upgrade comes standard with the appliances, and it provides a virtual presence for remote management capabilities of the appliances. The Lenovo Storage DX8200C includes basic light path diagnostics, which includes system LEDs on the front of the appliance and LEDs near the monitored components (for example, the DIMM error LED on the system board). Lenovo XClarity is a centralized systems management solution that helps administrators deliver infrastructure faster. This solution integrates easily with Lenovo System x M5 and X6 rack servers, Lenovo Storage DX Series, Converged HX Series appliances, and Flex System, providing automated agent-less discovery, monitoring, firmware updates, configuration management, and bare metal deployment of operating systems and hypervisors across multiple systems. Lenovo XClarity Administrator is an optional software component for the Lenovo Storage DX8200C which can be downloaded and used at no charge to discover and monitor Lenovo Storage DX Series and manage firmware upgrades for them. If software support and subscription is required for Lenovo XClarity Administrator, Lenovo XClarity Pro software subscription must be ordered. Lenovo XClarity Pro is licensed on a per managed system basis, that is, each managed Lenovo Storage DX8200C system requires a license. The following table lists the geo-specific Lenovo XClarity Pro software license options. the CMC depends on the user type associated with a user account. Managing quality of service (QoS) controls. Creating and managing rating plans. Generating bills. Viewing and managing users’ stored data objects. Setting access control rights on users’ buckets and stored objects. Group administrators can perform a more limited range of administrative tasks pertaining to their own group. Regular users can perform S3 operations such as uploading and downloading S3 objects. Lenovo XClarity Energy Manager is an optional, separately orderable software component for the Lenovo Storage DX8200C that is licensed on a per managed node basis; that is, each managed Lenovo Storage DX8200C system requires a license. System on: 5 °C to 40 °C (41 °F to 104 °F); altitude: 0 to 950 m (3,117 ft); decrease the maximum system temperature by 1 °C for every 175-m increase in altitude above 950 m.
Under no circumstance can any combination of worst-case workload and configuration result in system shutdown or design exposure at 40 °C. The worst-case workload (like Linpack, Turbo-On) might have performance degradation. The Lenovo Storage DX8200C has a three-year customer-replaceable unit (CRU) and onsite (for field-replaceable units [FRUs] only) limited warranty with standard call center support during normal business hours, 9x5 Next Business Day replacement parts delivery, and Remote Technical Support (RTS) services. Also available are Lenovo Services warranty maintenance upgrades and post-warranty maintenance agreements, with a well-defined scope of services, including service hours, response time, term of service, and service agreement terms and conditions. The Lenovo local support centers perform problem determination and resolution for hardware-related issues and escalate to Cloudian, on behalf of the customer, for software-related problem determination. Cloudian will contact the customer and will own the software-related problem resolution until closure. On-site service A service technician will arrive at the customer’s location for equipment service. Parts delivered A CRU will be delivered at the customer’s location for replacement by the customer, or a service technician will arrive at the customer’s location to replace a FRU. Technician installed parts A service technician will arrive at the customer’s location to replace a CRU or FRU. 24x7x2 hour A replacement part is scheduled for delivery or a service technician is scheduled to arrive at the customer’s location within two hours after remote problem determination is completed. Lenovo provides service around the clock, every day, including Lenovo holidays. 24x7x4 hour A replacement part is scheduled for delivery or a service technician is scheduled to arrive at the customer’s location within four hours after remote problem determination is completed. Lenovo provides service around the clock, every day, including Lenovo holidays. 9x5x4 hour A replacement part is scheduled for delivery or a service technician is scheduled to arrive at the customer’s location within four business hours after remote problem determination is completed. Lenovo provides service 8:00 am - 5:00 pm in the customer’s local time zone, Monday-Friday, excluding Lenovo holidays. For example, if a customer reports an incident at 3:00 pm on Friday, the technician will arrive by 10:00 am the following Monday. 9x5 next business day A replacement part is scheduled for delivery or a service technician is scheduled to arrive at the customer’s location on the business day after remote problem determination is completed. Lenovo provides service 8:00 am - 5:00 pm in the client's local time zone, Monday - Friday, excluding Lenovo holidays. Calls received after 4:00 pm local time require an extra business day for service dispatch. Next business day service is not guaranteed. Committed Service Repair (CSR) enhances the level of Warranty Service Upgrade or Post Warranty/Maintenance Service offering associated with the selected systems. Offerings vary and are available in select countries. Lenovo’s YourDrive YourData service is a multi-drive retention offering that ensures your data is always under your control, regardless of the number of drives that are installed in your Lenovo server. In the unlikely event of a drive failure, you retain possession of your drive while Lenovo replaces the failed drive part. Your data stays safely on your premises, in your hands. The YourDrive YourData service can be purchased in convenient bundles with Lenovo warranty upgrades and extensions. The Lenovo Storage DX8200C includes three-year, four-year, or five-year software support and subscription (depending on the selected warranty service upgrade and software license) that entitles you to submit service requests to troubleshoot Cloudian software issues and receive code updates, including fixes, patches, and new software releases. The following table lists the top-of-rack Ethernet switches that are offered by Lenovo that can be used in Lenovo Storage DX8200C solutions. The following table lists the rack cabinets that are offered by Lenovo that can be used in Lenovo Storage DX8200C solutions. The following table lists the power distribution units (PDUs) that are offered by Lenovo that can be used in Lenovo Storage DX8200C solutions. The following table lists the uninterruptible power supply (UPS) units that are offered by Lenovo that can be used in Lenovo Storage DX8200C solutions.